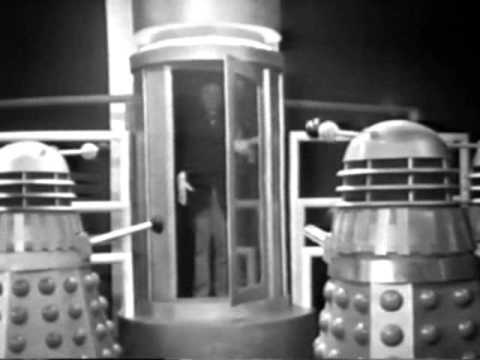 Less than 18 months after their creation, the Daleks made their third appearance as the Doctor’s arch enemies in the six part serial, The Chase. 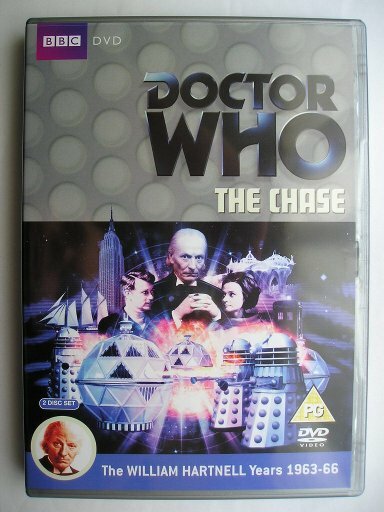 Almost universally panned in fan circles as the worst Dalek story ever, The Chase is not entirely without merit. 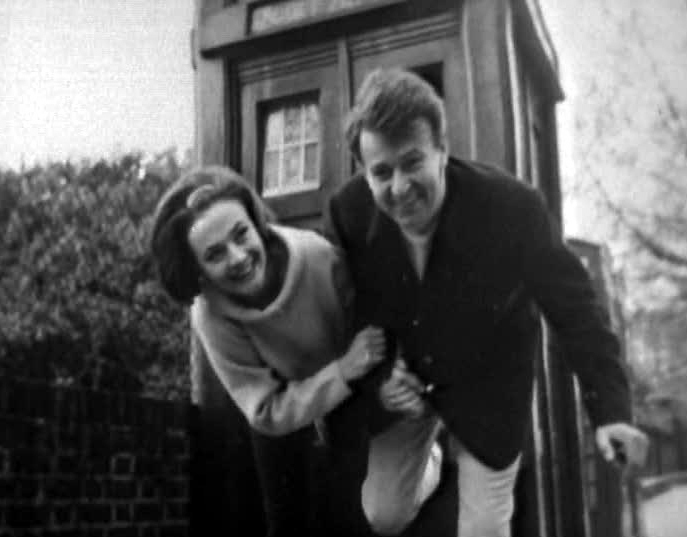 It is in this story that Ian and Barbara leave the Tardis for the last time and return to 1965 London. Their arrival home in the Daleks’ time travelling ship is one of the most iconic and best remembered segments in Who’s history. The still photography of the teachers playfully posing against a variety of London landmarks joyfully demonstrates their relief to finally return to what passes as normality. How did they explain away their two year absence from Coal Hill School? That’s a mystery that remains unanswered. Ian and Barbara enjoy London as they pose in front of a real Police Box. Yes, they really did exist! Prior to their tear jerking departure from the Doctor and Vicki, Ian and Barbara were as close to home as 1966 New York. It was on the Empire State Building, in episode three, that the viewer meets the character of Morton Dill, played by Peter Purves. The viewers and the production team alike were unaware that Purves would reappear in episode six of that same serial as a stranded spaceship pilot on the planet Mechanus, named Steven Taylor. Evidencing the almost complete absence of forward planning in the Doctor Who camp, the decision to appoint a replacement for Ian and Barbara was not made until Purves impressed all concerned during his role as a naive tourist from Alabama. In a period of less than three weeks Purves went from a bit-part extra to a companion-in-waiting. It would not be until the next serial, The Time Meddler, that the character of Steven Taylor would be officially invested into the Tardis Crew. Purves was the first person to have appeared as two separate characters in the same Who serial. 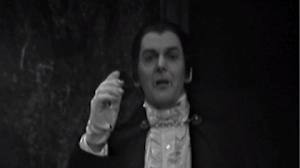 My 12 year old son considers Peter Purves to be the Doctor’s best companion solely based upon his portrayal of Morton Dill. And he wasn’t even a companion then! My son loves the Alabama imbecile and finds it hard to contain his laughter as he watches Dill’s onscreen antics. Purves’ attempt at an American accent was at least consistent in that episode, unlike the season three story, The Gunfighters, where he occasionally forgets that he’s meant to be from the USA. Moreover, we don’t have to listen to him sing in The Chase! A Mechanoid. The “next big thing” that wasn’t! Not surprisingly, The Chase witnesses a number of firsts. There’s the first, and regrettably only, appearance of yet another “next big thing”, the Mechanoids. Their unwieldy size, slowness and limited movement undoubtedly had much to do with this. It was not for want of trying that it took almost another 18 months for Doctor Who to eventually invent a genuine contender to the Dalek popularity stakes, the Cybermen. Another first and last was the Time-and-Space Visualiser, a large disc with television monitor which was taken as a souvenir from the planet Xeros’ Space Museum. 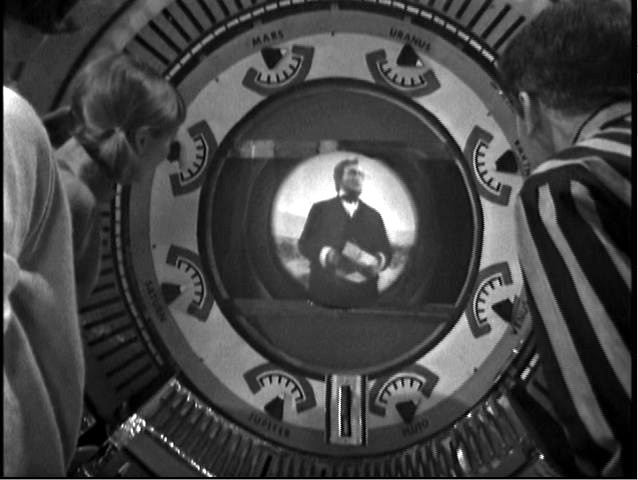 Seemingly programmed by punch cards, the Visualiser enabled the Tardis occupants to view any event in history’s past. To demonstrate the machine’s awesome powers the crew were treated to clips from Abraham Lincoln’s “Gettysburg Address”, William Shakespeare conversing with Queen Elizabeth 1, and most prestigiously for Doctor Who, the Beatles performing in 1965. The Beatles clip was no mere piece of stock footage from the BBC Archives, but a song filmed specifically for Who and also shown on Top of the Pops. The Chase is the first to feature an evil android Doctor. 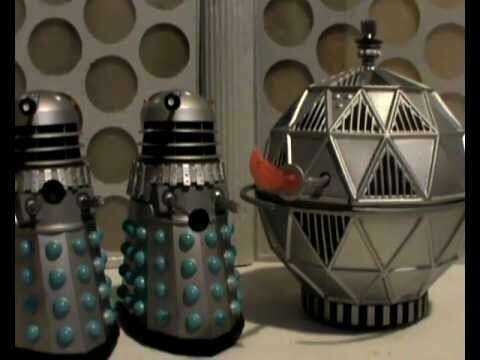 The serial also sees debut of the redesigned Daleks, who at last have their own time machine. Why is it that The Chase is held in such low regard? The answer would undoubtedly vary from person to person, although the hybrid nature of the story must be a likely cause. There are so many elements thrown in together, with no satisfactory explanation why. The only plot involves the Daleks chasing the Doctor and his crew to various locations throughout the universe. The Doctor is the Daleks ultimate enemy as he thwarted their attempts to commandeer the Earth as a spaceship in The Dalek Invasion of Earth. 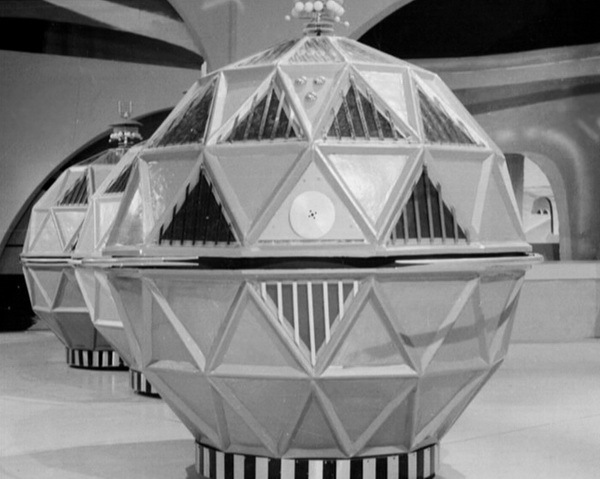 At least in The Keys of Marinus the crew were endeavouring to retrieve the lost keys to the Conscience of Marinus, and their adventures encompassed a series of locations and terrains on only one planet. During the course of The Chase the Doctor and his companions are variously in a Haunted House; the Mary Celeste; New York City; and the planets Aridius and Mechanus. Bizarre is a less than adequate word to describe the Tardis Crew’s adventures in the Haunted House in which with a robotic Count Dracula, Frankenstein and Grey Lady reside. One is left wondering why, and whatever was Terry Nation thinking at the time. Nation would also have us believe that Daleks were the cause of the mysterious disappearance of the crew of the British-American merchant ship, the Mary Celeste, in 1872. 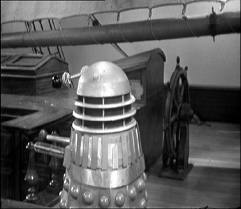 The Daleks also had a keen interest in New York’s Empire State Building. Had the Twin Towers been built in 1965 then I’m sure Nation would have positioned them there instead. 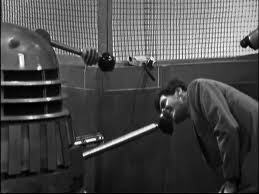 It almost seems as though Nation was giddy on the success of the Daleks and had assumed that viewers were gullible enough to accept anything thrown at them. Clearly the BBC production team agreed, at least at the time. In retrospect, however, such criticism fails to acknowledge the sheer fun of the story. And it’s probably the gaiety of this serial which is the principal reason why The Chase is held in such high disregard. Daleks are meant to be menacing and intimidating. Throw in a mix of comedy interludes and the foreboding in which they are ordinarily met quickly evaporates. Viewers have no need for bothersome distractions of a witty nature. They just want to be terrified, even if by mid 1965 it was plainly obvious that the Doctor and his companions always triumph. 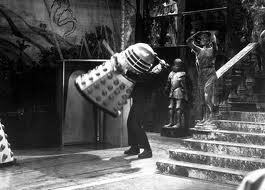 The Daleks’ next appearance, in six months time, did not suffer from a similar fate. The highly regarded 12 parter, The Daleks’ Master Plan, gave the audience three solid months of terror and the first time, the death of not only one, but two companions. Hereafter the security of the Tardis Crew could never again be assured. 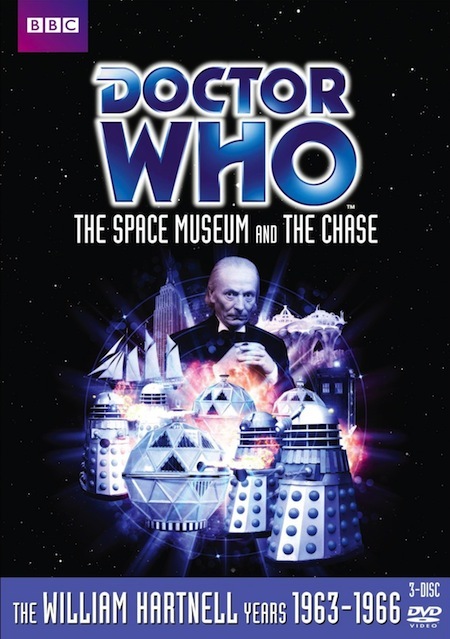 The Chase was released in a Box Set with The Space Museum entitled (you guessed it!) “The Space Museum The Chase”.